Hello. I am Peter, an inveterate roadster driver and long-time resident of Eagle River, Alaska. I cut my roadster teeth in the 70’s driving MGBs– three of them to be exact, (a ’67 and 2 ‘68s)– in Montana, Wyoming, and the Black Hills of South Dakota. I got thoroughly hooked on the roadster concept at an early age. Then I moved to Alaska (w/o a B-car), raised a family, and got involved in salmon fishing, moose hunting, and other things. But last summer, I made acquaintance with the MX-5 (we call ‘em Miatas here) and loved the concept of the reviving the roadster (Jinba ittai), using modern technology, such as double wishbones all around. Not to mention the great low prices for older, used models. So, I picked up a high-milage white 1996 MX-5 Miata. The body is in dandy shape and the motor is still quite punchy– at least by MX-5 standards. But the suspension was all original, and plain worn out. I replaced the shocks w/ custom adjustable gas coil-overs, installed beefier anti-roll bars, got new tires, and custom brakes from Flyin’ Miata (http://www.flyinmiata.com, gotta love these guys). 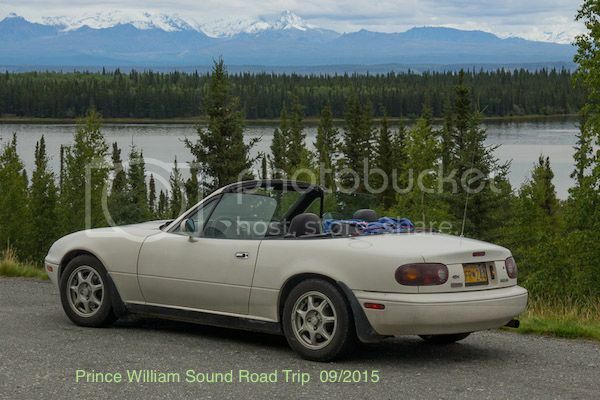 Oh yeah, and I joined the Alaska Miata Club. Now I am not an auto-cross kind of guy, but I had to take this car on a before-and-after test track drive. What a fun car! And what a difference $3000 in undercarriage work makes. I am totally sold on the MX-5. Just wish I had come to this realization 10 years ago. Another of my long-time passions is Scotch Whisky. I am hoping to combine both passions with a motor tour of Northern Scotland ’s distilleries this next summer. Problem is, I won’t have my MX-5. So my question to y’all is this: Any tips on where can I hire (or lease) an MX-5 in Scotland for the 2nd half of August (no auto transmission)? I know that locals don’t tend to hire cars, so this forum may not be the best place to ask. Still, it is a start, and Google is not giving me useful answers. PS: Yes, we did have a major earthquake (mag 7.1) early this morning (1:30 AM 24/1/2016 AKST) here in Cook Inlet. Fortunately, casualties were few to none, largely due to a sparse population and an aggressive building code that anticipates such natural disasters. After all, Cook Inlet does have a history of bad earthquakes (e.g. mag 9.1 in 1964)... Also, fortunately, no tsunami was generated. I do not think there are any MX5's for hire at the moment in Scotland but leave it for a month or so and maybe someone will come up with an idea. Plenty of MGB's available in Scotland at around $1,500 a week. One website has an MX5 and is here. The link below seems to have a 1992 MX-5 for hire. Might be worth getting in touch to see if they still have it. The best of luck in sourcing a car, but if successful don't combine the driving and the whisky tasting at the same time!!!! You must be one of our furthest flung forum members. If you are going to be visiting the very North of Scotland where I live (we have 6 of the best whisky distilleries all within a driving distance) we have a Mk 3 MX5 you are very welcome to borrow for a few days. We are north of Inverness. and also have some of the best driving roads in Scotland We did this for a cousin from Canada, the insurance was simple to arrange and was surprisingly not expensive. You may also want to take a look at this site, they seem to have 3 Mk1's for hire at reasonable rates.